Friday June 30th 1922 I had a good night. went down to train station for my breakfast. While waiting at Bureau got dinner and wrote to Lydia. Home at three-thirty. Come over in taxi. Rob & Cora out to picnic supper. I ate and spent evening with Ott. Saturday July 1st 1922 I was busy all forenoon cleaning up my part of the house. Had letter from Ida & card from Nellie. I wrote Ida. Ott up after supper. I spent evening alone. Sunday July 2nd 1922 Rob went to the store early to work awhile. After late breakfast we took Mrs Sheldrick to Coralville of an errand. Then drove down to Aunt Ellens. Home for early dinner. I wrote to Hattie. Supper with Ott and we took a ride past west farm. 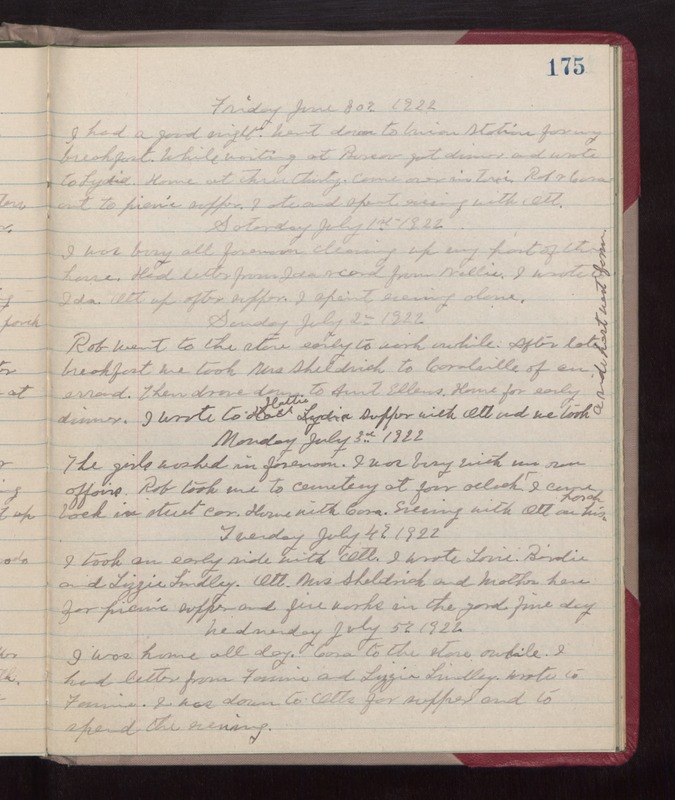 Monday July 3rd 1922 The girls washed in forenoon. I was busy with my own affairs. Rob took me to cemetery at four oclock. I came back in street car. Home with Cora. Evening with Ott on his porch. Tuesday July 4th 1922 I took an early ride with Ott. I wrote Lorie, Birdie, and Lizzie Lindley. Ott, Mrs Sheldrick and Mother here for picnic supper and fire works in the yard. fine day. Wednesday July 5th 1922 I was home all day. Cora to the store awhile. I had letter from Fannie and Lizzie Lindley. Wrote to Fannie. I was down to Otts for supper and to spend the evening.